A microwave/toaster oven combo allows you to bake without firing up a traditional oven, which can save time, money and prevent your kitchen turning into a hot box. What is the best convection microwave? Our top pick is the Cuisinart CMW-200. We love the multi-stage cooking capabilities that make short work of what can otherwise be a complicated process. The convection roast and fast bake modes work well and this model helps simplify time spent in the kitchen. In this guide, we will compare microwave models in our table and convection microwave reviews to help you find the best microwave toaster oven combo for you and your kitchen. The Cuisinart CMW-200 offers some of the best programmable features of any of our picks. The coolest thing about this unit is that it can be programmed for multi-stage cooking. You can set it to defrost on low power, heat on high power, then brown using the oven with a single sequence of button presses. This feature alone sets this unit above the rest. Its grill feature seems to be a clever renaming of the microwave and oven mode combo, but the functionality is the same as other convection units. The oven has a variety of special modes, including Convection Roast and Fast Bake that automatically modulate the temperature of the oven to make your cooking experience easier. Cuisinart recommends 3 inches of free space at the sides and back of this unit and 12 inches of vertical headspace, so you’ll have to keep this in mind when measuring your counter space. If you’re looking for a microwave with toaster that has convenient, programmable cooking modes, the Cuisinart CMW-200 convection microwave is definitely worth considering. Samsung’s microwave features innovative cooking routines and smart options to cook your food without you guessing cooking times or power levels. The grill plate is especially handy as it reflects heat from the broiler back at your food, giving this unit a much closer simulation of an actual grill than its competitors. Simple dial-a-temperature, preheat notification, and timed shutoff help make the oven easy to use. The interface for this microwave is somewhat confusing. The microwave is “smart” and the preset modes take a food type, weight, and cooking type (microwave, oven, grill, etc.) as input. After some calculations behind the scenes the Samsung MG14H3020CM comes up with a cooking time and power level. This is great except that you don’t know how long your microwave will want to cook things for. With a slightly lower wattage, things may take a bit longer to cook, but the difference is negligible. It compensates for lack of power by being generous in size, with a 1.4 cubic foot capacity. Aside from what it can do, this model is exceptionally attractive. The black mirror finish gives it a super-sophisticated, sleek look, and surprisingly, finger prints marks aren’t really an issue – it’s easy to keep clean inside and out. 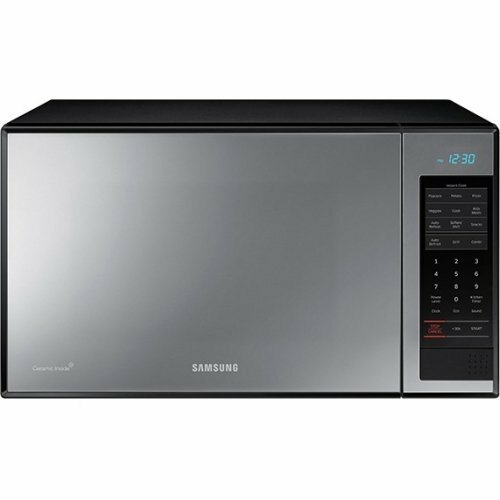 If you’re looking for a convection microwave with a grill and oil-less fryer mode, the Samsung Countertop model might be one to consider. 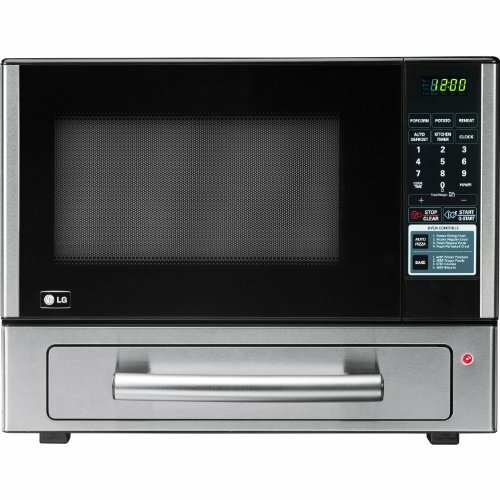 This Sharp model is a roomy unit that offers sensor cooking and a variety of convection modes. Sensor cooking allows you to put food in the microwave, press a button or two, and then wait patiently as the microwave adjusts the cooking time and temperature to match the food that you put in. Because this unit is only 900 watts, it makes cooking times a bit longer than a 1000-watt unit. Realistically, this will only affect you by increasing the time it takes to boil water by thirty seconds or so. Another issue to consider is that the turntable has a rather under-powered motor and is supported by plastic gears. If you’re cooking heavy food, try to use the racks instead to prevent strain on the turntable and gears. 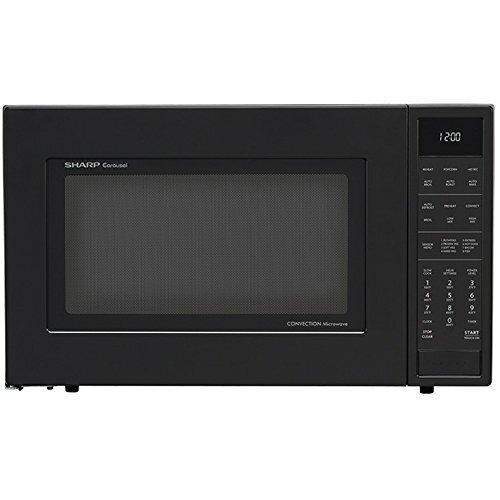 This Sharp unit is a simple convection microwave with innovative roast settings and another unit worth consideration. Panasonic’s patented inverter technology is designed to provide a steady stream of power at any temperature setting, which helps your food to be heated evenly and consistently all the way through. Panasonic offers a mounting kit for your cupboard, similar to an over the range microwave. If you elect not to use this option, be sure to leave adequate space around your oven to safely dissipate heat. While other microwaves only have two modes of microwave cooking (“on” and “off”), Panasonic’s Inverter technology allows this microwave to actually cook at 30% or 50% power. Normally, when you adjust the power level on your microwave, it simply pulses between on and off every several seconds to heat food more slowly. Panasonic claims that by heating on a lower power level the entire time, their microwaves can cook food more evenly. While this feature is very nice in a traditional microwave, it’s somewhat less novel in a convection model. In a convection microwave, you can simply turn on the fan and put the oven on low to assure even distribution of low heat. There’s no need to memorize numbers or codes, you just press a few buttons and follow the instructions on the display. This model also has a turbo defrost, keep warm feature, quick-minute timer and delayed start feature. While the inverter means this microwave toaster oven has some pretty unique functionality, it’s also more difficult to repair in the event that it breaks. Be sure to investigate warranty options because the one year default may not be enough. This is the most powerful model reviewed; with 1200 watts of power, your food will be ready a lot more quickly, but the inverter technology saves it from feeling “nuked.” No more overcooked edges and raw centers! 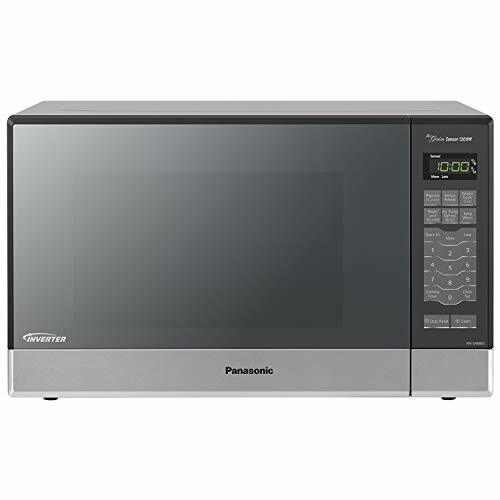 If you’re looking for a convection microwave that allows precision temperature control for both the oven and microwave components, check out the Panasonic NN-SN686S microwave oven combo. Update: Originally, we reviewed the LG LCSP1110ST microwave toaster combo which included a pizza oven. Since then, this model has been discontinued. This wasn’t a true convection microwave because the oven unit was entirely separate from the microwave unit which led to some unique advantages and disadvantages. The oven unit was a small “pizza drawer” that slid out from below the microwave. While it was small vertically, it was more than large enough for a 12″ frozen pizza, a cookie sheet, or a couple of sandwiches. Because the oven was small, you didn’t need to worry about preheating; it heated up very quickly and evenly. This also meant that you were free to use the microwave while you baked. For example, you could warm up extra sauce while a pizza baked or boil water for tea while you made cookies. One of the major draws to this convection microwave was the ability to use both cooking modes in tandem. We loved the two units combined and hope that another manufacturer will bring back a similar unit. Cook your food however you want; the Emmerson Convection Microwave Oven offers convection, microwave and grilling capabilities. This model doesn’t have extra bells and whistles, but does a fine job of the basics. Food cooks evenly, there’s instant start mode and no confusing extras. The touch pad control is simple to use and the LED display clear and bright. If you’re using the oven to defrost, you can quickly and easily enter the food’s weight. The oven will calculate the correct time and power – or you can manually set these variables yourself. The glass turntable is rather heavy and operates a tad slowly – this model is also somewhat louder than others reviewed; if you’re looking for a whisper-quiet unit, give this one a miss. The Emerson Convection Microwave Oven has generous capacity, at 1.5 cubic feet. It’s a good, standard model, attractive in black with stainless steel trim and handle. If you’re after a reliable machine that covers the basics and gives you plenty of cooking options, this might be the one for you. 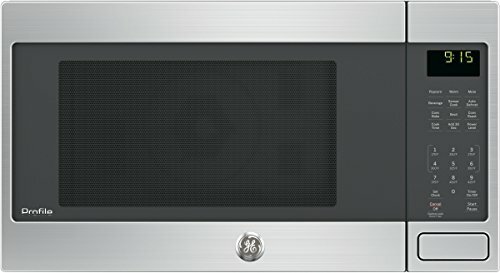 The GE Profile Countertop Convection/Microwave Oven is a higher-end model that will add a dash of style to any kitchen. If you have limited kitchen space and are looking for a model that takes up a little less room, this should fit the bill. At only 13-inches high, it should be able to squeeze into some tight areas. Bear in mind, however, that you may compromise on cooking area inside. Although the specs say 1.5 cubic feet interior, by the time you take into account the turntable and trays, you don’t have a lot of room to move. 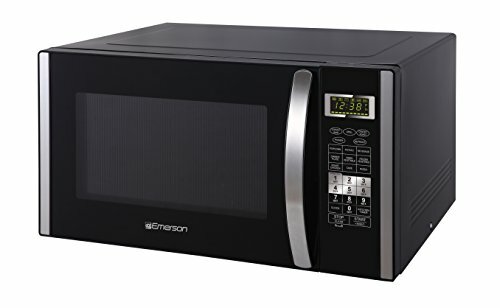 This model does extremely well as a microwave; the 1000 watts provide fast cooking times and there’s even a sensor cooking mode which cleverly reads the humidity of your food to figure out when it’s done. GE have included all the little extra features you might need, such as the ability to turn the display on and off, mute the beeps, and of course, there’s the simplicity of an “add 30 seconds” button. When it comes to the convection capabilities, however, you may find this oven lacking. There are both bake and roast modes, which can be handy for smaller projects, but overall this convection oven struggles to reach the correct cooking temperature. Using the convection mode can be frustrating, and your food may take considerably longer than anticipated to cook. This GE convection microwave combo will suit those looking for a more compact model to fit a smaller space in the kitchen. It’s attractive and works well as a microwave. If you’re planning to rely heavily on the convection capabilities, you may be disappointed. Convection microwaves come with all the electronic control amenities you would expect in a modern microwave but the biggest attraction is the combined cooking methods. You can use the microwave to quickly heat up your food as the oven preheats, then take advantage of the fan to circulate air while it sits in an oven, browning the outside. Finding the best convection microwave for your kitchen is a matter of determining what you need and seeking options available. 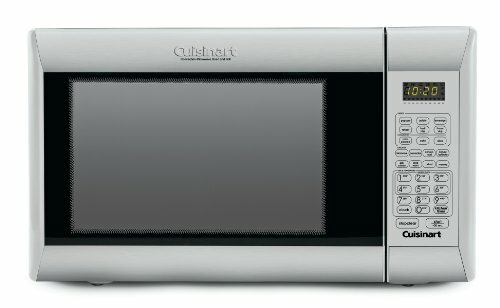 The versatile Cuisinart CMW-200 Convection Microwave beats out the other models reviewed here simply because it has so many functions and options, all packaged together in an attractive oven that is simple to operate and a pleasure to cook with.